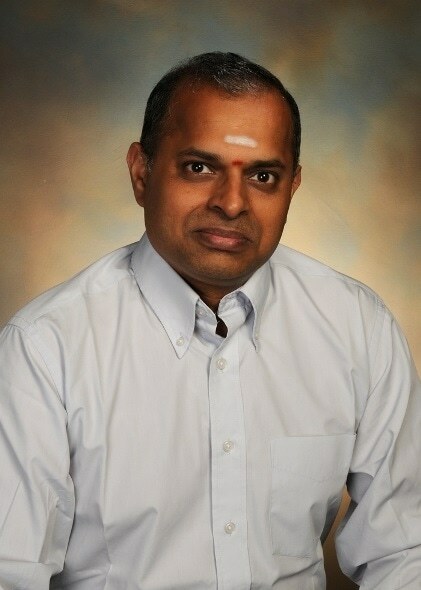 Ram Krishnamurthy is an associate professor of chemistry at The Scripps Research Institute. But the key here is that somehow, random molecules assembled themselves into self replicating engines, not just once but perhaps millions of times before making a sustainable life form. The odds against such events are more than astronomical, they are completely beyond belief! Face it dudes, life began on earth as a result of intelligent design. I know that doesn't fit with your atheism, but that is the ONLY reasonable explanation. A "super designer" coming from nothing and creating the life universe and everything sounds far more complicated than 'self replicating engines". Its wonderful to see that Ram Krishnamurthy, who from his photo (the stuff on his forehead) seems to be a devout Hindu, strongly believes in Science to explain evolution. "The finding supported previous research from Nobel laureate and Harvard University Chemistry and Chemical Biology Professor Jack Szostak that showed a loss of (nucleotide-binding aptamer) function when RNA mixed with DNA." Believers already know how life came to be..a great entity just willed it and presto!..there was life on earth. Ram Krishnamurthy may I give you some knowledge of where to find that true information about how man got started I will give you some direction. Yes it was God the creator of all things who made that things you think is the beginning, you can't jump to one thing made away from how did it get here in the first place, as in who created it. If you really want to know how man got started read the Book of Genesis the Holy Bible written by the inspiration of God the Creator of all things including you. If you want to think you came from some sore of something, ask yourself, How did this thing come to be and if you find that thing ask yourself how did this thing come to be. God made all things and he has been here since before time began. "New TSRI study offers surprising twist on how life began on Earth"
MAY have begun ... there are a LOT of assumptions about this topic, none of which can be proven in any way. Cut the crap, we were put here by aliens millions of years ago. Moronity TSRI and NASA has no limits. DNA has not evolved. DNA was created and was converted by revolutionary way. Come on people, we all know how it happened! 6000 years ago man created man! In his image! Done end of story. This article lost me the minute i read believe .,.. “Even if you believe in a RNA-only world, you have to believe in something that existed with RNA to help it move forward,” said Ramanarayanan Krishnamurthy, associate professor of chemistry at TSRI and senior author of the new study. Sadly the use of the word believe/belief in any scientific article loses its currency. Science is not based on any belief, it strictly based on observable facts that supports a hypothesis. Science needs to remove the word "believe/belief" from its vernacular!!! This is why the religious fanatics point to science as a region WHICH IT IS NOT!! Animal life began when God (JESUS) spoke it into existence. Human life began when God (JESUS) breathed into man the breath of life. Any other explanation is foolishness. The truth is that we were all "space travelers" floating through "inner space" for nine months, and then expelled into an environment where absolutely Nothing was recognizable! The arrogance on display throughout history by some of us "humans" is truly astonishing! The answer is that "origin" questions are unknowable and those "guess and by golly" speculations border on silliness! What we call God and when we state that we ourselves are created in the "Image of God, all we really know as truth is that , looks aside, Only "God" can "exnihilate", that is toe create something from nothing, so where we share in that image, we have a similar ability to create, but can only create something from or out of something else! They used to tell us that the "primordial chemical soup" was energized into life by cosmic radiation and/or lightning storms. I guess that one went out the window, too. Another scientific theory. I guess they have all the facts also. But which one to choose from. I vote none of them. Amazing study, and outstanding results. So many scientists are so blinded by their refusal of the possibility that God created the world that they do not see how ridiculous their theories are. So, RNA couldn't have converted into DNA, so they had to have started evolving together. The whole point behind the original RNA to DNA theory was that RNA is less complicated and therefore more plausible to have spontaneously self-assembled. Now we are told that even the more complicated DNA came together automatically. Yet we are to believe that DNA and RNA could spontaneously self-assemble by some fantastic chemistry. I'm sorry, but biogenesis is simply impractical and using probability completely impossible. Two things in the history of our planet prove that "Life" did not evolve but was a product of intelligent design. One, the water here on our planet was the cooling factor in a world that was once Molten. It did not get here by asteroid nor comet, as it would have left a serious dent, as the molten rock would have hardened at the edges of the Ice where it came to rest, and we have no evidence of such a dent. The water is here though, leaving only two possibilities as to how we came to have enough water that if you formed it all into one sphere and place one edge at the east coast of the United states, the other edge would be in Idaho. Either as a liquid, or a Chemical process combining Hydrogen and Oxygen. As water will freeze in space it seems like a large spaceship would be required for liquid arrival. However the Hydrogen and Oxygen would have arrive here at the same time, or both would have just burned off as they are both flammable. Arrival at the same time would require intelligence. So how is this proof that evolution didn't happen? read Genesis, in the Bible, first it was dark and void, and standing on the moon you most likely would not even see the earth. In it's molten state it would still adhere to the laws of Physics, a perfect sphere, and reflecting no light from a black surface, and the only light at all would most likely be at the noonish part or half the day rotation as the back side away from the sun would be as cold as is the dark side of the moon, and would take some time to melt as it entered the suns light. Still it had to be cooled to support the variety of life that exists today. "And god said let there be light". Steam would have reflected light, very effectively, yet that wouldn't follow what the Bible said happened nor would you find the Science supporting a liquid arrival. " And God said, Let there be light: and there was light. 7 And God made the firmament, and divided the waters which were under the firmament from the waters which were above the firmament: and it was so." from the Vulgate firmamentum, which is used as the translation of the Hebrew raki'a . This word means simply "expansion." It denotes the space or expanse like an arch appearing immediately above us. They who rendered raki'a by firmamentum regarded it as a solid body. The language of Scripture is not scientific but popular, and hence we read of the sun rising and setting, and also here the use of this particular word. It is plain that it was used to denote solidity as well as expansion. It formed a division between the waters above and the waters below ( Genesis 1:7 ). The raki'a supported the upper reservoir ( Psalms 148:4 ). It was the support also of the heavenly bodies ( Genesis 1:14 ), and is spoken of as having "windows" and "doors" ( Genesis 7:11 ; Isaiah 24:18 ; Malachi 3:10 ) through which the rain and snow might descend. The other part is Pangaea, yes all the contents of the world fit together like a puzzle, that isn't really all that earth shattering unless you really look at it for a moment. Pangaea, for all that is as an Island, was once a complete sphere unto its self. Look at the land mass up towards Iceland and Greenland and realize it is a crack in the Puzzle. but to bring it together you have to bring the land masses together as a ball, and if you remove that ball from the face you have the earth as a cracked, but perfect sphere. There are over 70 different Myths and legends around the world of this planet having little to no land mass in the beginning, leave us with the question remaining. How could a book no matter how hold it may be, tell of an event that happened before a person could have ever possibly known something that we now face only as theory?